Do you know what SwiftCoupon is? SwiftCoupon is not an application computer users know a lot about. This is because in most cases they are introduced to it unexpectedly. You may click the download button of some video codec or Java update and face a bundled installer offering this seemingly useful browser extension. The installer on swiftcoupon.net is no longer active, so the developers of the program need the support from third parties for the successful distribution of the unreliable program. We believe it is a must to delete SwiftCoupon because this application supports third-party advertisers. Those who do not remove adware will be bombarded by advertisements which may be misguiding and which may be used to scam you. Every advertisement provided by SwiftCoupon is considered to be a security crack, and so clicking on them may jeopardize your virtual security. Of course, if adware and additionally installed threats are running, your virtual security has been breached already. Please follow the instructions below to uninstall the unwanted program from the PC and delete it from the browsers. As soon as the manual SwiftCoupon removal is complete, go ahead and scan the system for leftover files. Also, do not forget to delete additionally running threats. These tasks require some time and a lot of practical knowledge. If you do not have this, install a reliable security tool which will delete running malware automatically. Right-click the app you wish to remove. Click the trash icon next to SwiftCoupon. 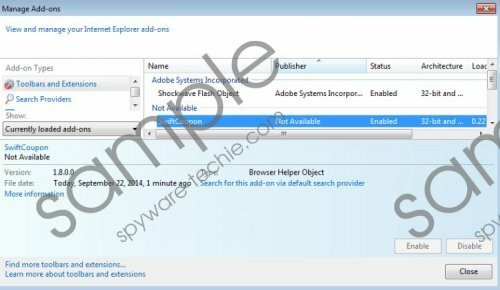 The guides provided below will help you install automatic malware removal software in those cases when SwiftCoupon comes bundled with highly malicious and disruptive software. If you have chosen to delete SwiftCoupon from the PC manually – follow the guides above and install a trustworthy malware scanner. Keep in mind that if you do not remove leftover files, your operating system may remain vulnerable. Also, do not forget to install reliable security software to keep other infections away. Tags: delete SwiftCoupon, remove SwiftCoupon, SwiftCoupon.